Nearly 750,000 people visit the Royal Opera House every year but only a few hundred have their names on seats in the auditorium. These opera and ballet enthusiasts have chosen to leave a lasting legacy by offering a seat-naming donation, which entitles the donor to their name engraved on a brass seat plaque and displayed for a generation, while supporting the artistic work of the Royal Opera House. It also comes with an invitation to a private viewing of the plaque and a backstage tour. So what inspires audience members to put their name on a seat? 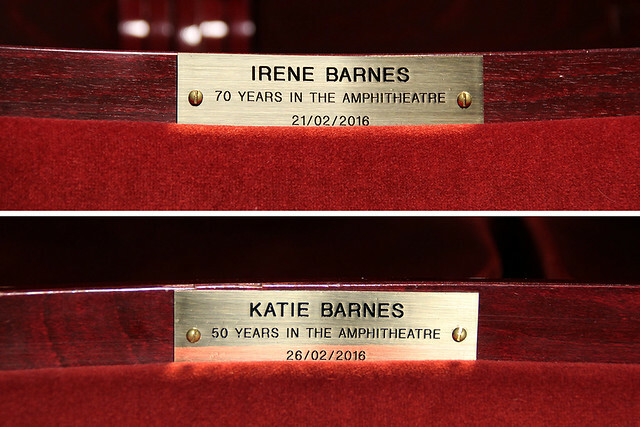 Mother and daughter Irene and Katie Barnes chose to put their names on seats U60 and V58. They remember clearly the first performances they attended at the Royal Opera House – Irene, the post-war gala opening of The Sleeping Beauty on 21 February 1946 and Katie, La Fille mal gardée on 26 February 1966. ‘When we realized that our 70th and 50th anniversaries at the Royal Opera House fell within a few days of each other, we decided to mark the joint occasion by using a small legacy from my late father to name two seats in the Amphitheatre. Starting out as ballet lovers, since 1981 we’ve become confirmed operagoers too, and we have enjoyed hundreds — if not thousands — of evenings here in our combined 120 years,’ says Katie. Do you have a favourite seat in the Royal Opera House auditorium? Share your stories below. Hello, please confirm that this counts as a charitable donation for UK taxpayers? Many thanks for your interest in naming a seat. I've spoken to our Fundraising Team about you inquiry who tell me that as The Royal Opera House is a registered charity no 211775, all donations towards naming a seat are considered a charitable donation and are eligible for Gift Aid for UK Taxpayers.